Take I-5 or Hwy 167 (the Valley Freeway) to Hwy 18 East (exit 142A). Turn Left onto SE 272nd. You will pass under Hwy 18. Continue on Covington Way approx. 2 miles (3.2 km). The road changes names to SE Covington-Sawyer and then SE 292nd. 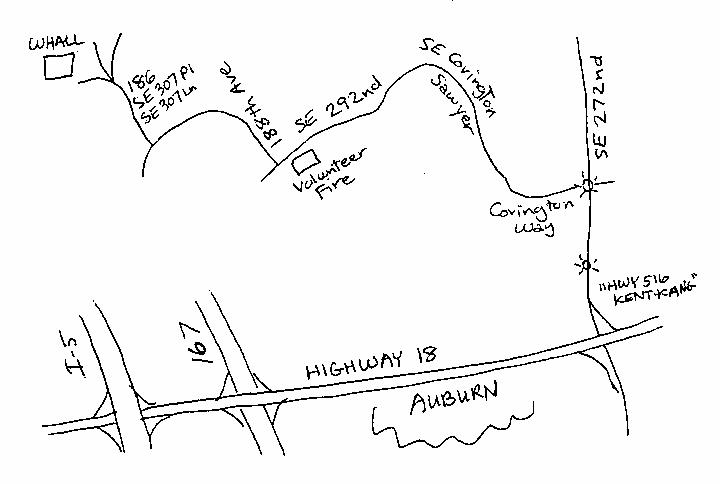 Pass a volunteer fire station on the left, then turn Right onto 188th Ave SE. Go approximately 1 mile (1.6 km) south, pass the Covington water towers and go under power lines. Approximately 1/4 miles (.4 km) past the water towers, the road will curve to the left. JUST BEFORE this curve, turn Right at the sign post labeled 186 PISE, SE 304 Ln, SE 307 Pl and Private Road. Follow the pavement down a steep hill. At the bottom of the hill the road becomes gravel. Take the left branch. Turn Right at the first driveway which is marked with a yellow Cairn Xing sign. Go to the end of the driveway. Park in the orchard between the road and the house. There is limited parking, please carpool if possible. Turn Right onto SE 272nd. Turn left onto Covington Way (2nd stoplight) and follow directions listed above.